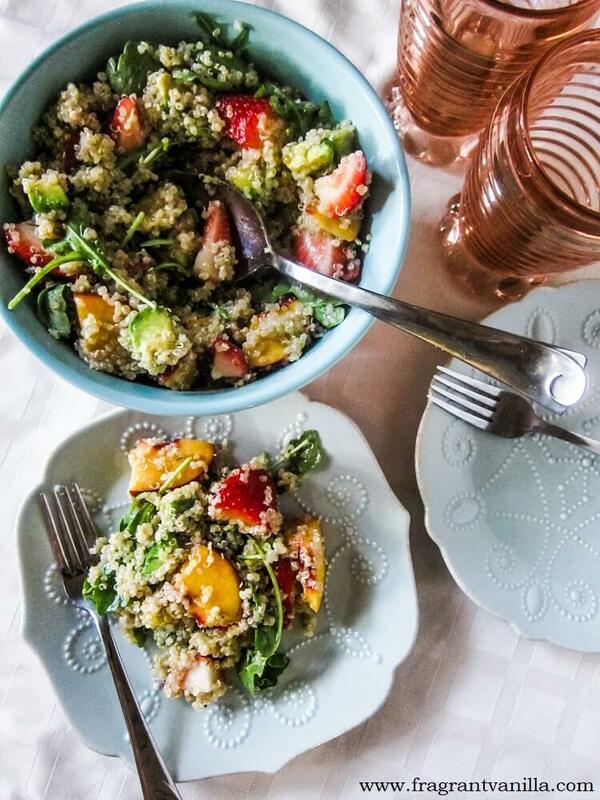 We have a quinoa salad in the deli I work in that has Summer fruits in it and it is pretty popular. 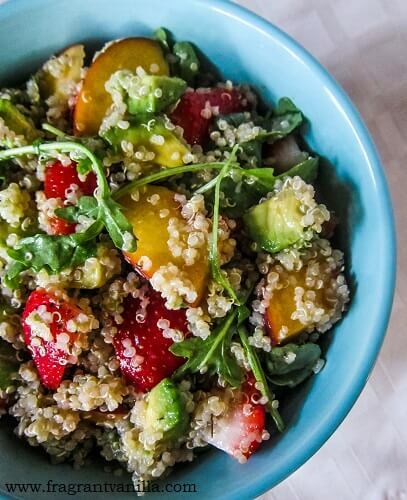 You wouldn't think that quinoa and fruit would be a pair unless it was a breakfast quinoa or something but it actually really works as a savory salad! 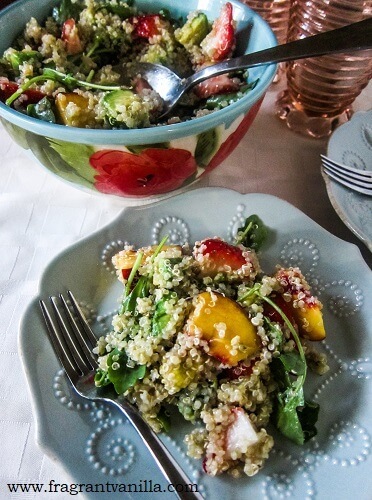 I actually have made quite a few quinoa salads with fruit at home too, and they are always delicious. The fruit has to be ripe and flavorful though. Buying fruit that is in season and ripe is the key to success when making dishes that include it. Especially if it is going to be raw. I decided to make one last weekend because I had extra peaches and strawberries from making a crisp, and didn't feel like using them for dessert. They were perfectly ripe, the peaches had that delicious aroma and the strawberries were packed with flavor. So I thought that a simple salad would be best to let the flavors shine through. I love that quinoa is quick to make, contains protein and is a neutral flavor so it can be combined with pretty much anything. I make it several times a week for those reasons. I had made some ahead of time for a different meal, so this salad came together fast! In addition to the fruit I felt like the salad needed something rich. I usually pair a home made vegan chevre (goat cheese) with fruit in quinoa and it is delicious but I don't always have it on hand, so sometimes I use avocado instead. Trust me, it is just as satisfying as the cheese, and I always have some on hand because I buy a bag of avocados every week since I love them so much. 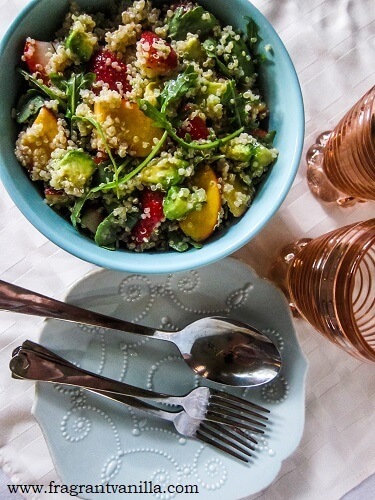 You may be thinking avocado and fruit sounds weird together but they totally pair with each other! I also added some greens in the form of arugula to the salad, because I always try to get a serving of greens in every day. I stir them into soups, toss them into salads like this or use them as a base for a salad, but they are something that I always have in my refrigerator and work into my diet every day. Lastly, I made a simple lemon dressing with a hint of thyme and it was so good once it was all mixed together! It is satisfying, balanced, and you will feel great after eating it! 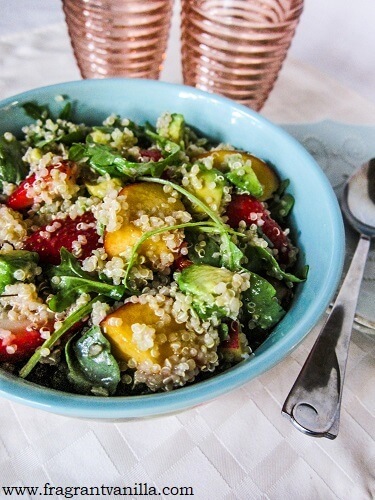 If you are looking for a more substantial Summer salad, give this a try! Only a few weeks of Summer left, so might as well enjoy it while you can! To prepare the quinoa, place quinoa and water in a medium saucepan and bring to a boil. Reduce to a simmer, cover and cook until all the water is absorbed about 15 minutes, or when all the grains have turned from white to transparent, and the spiral-like germ has separated. Drain, and set aside. Whisk together the lemon juice, avocado oil, sea salt and thyme in a small bowl. To assemble the salad, combine all remaining ingredients in a bowl and the dressing, and toss together until well combined.